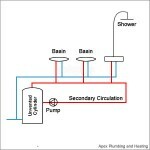 If there is a significant delay from turning on your hot tap to actually getting hot water, then secondary circulation should be a considered. This is often necessary in larger installations with longer pipe runs. The water contained within the pipes needs to be drawn off, (and typically wasted!) before fresh hot water becomes available from the cylinder. Furthermore, the newly replenished hot water in the pipe will again cool down, only to be drawn off again, the next time the tap is used. This is inefficient and encourages water wastage; a volume of water is heated, allowed to cool and then drawn off. This can be overcome by installing a secondary hot water circuit, which works by circulating hot water around the property close to the outlets in the bathrooms and kitchen so whenever you turn on a tap, the hot water is almost instantaneous. Secondary Circulation circuits can generally be retro-fitted to existing systems, but the amount of work (and cost) involved ultimately depends on the existing system layout and design.